Playing good rhythm guitar is about supporting, propelling and generally adding feel. Let’s comp. Despite the intimidating notation, the physical moves really aren’t that difficult. Rhythm guitar, often referred to as “comping” in the jazz or blues fraternity, is something of an enigma in that many people find it so natural yet others don’t. Remember: a well-played rhythm part can be indispensable, so aim to make your contribution in this department indispensable, too. Always try to make the part fit and, more specifically, sit. If a producer says the rhythm guitar, or anything else for that matter, isn’t sitting right then they mean that it’s going against the grain in some way (it may simply be too loud or have the wrong eq). You’ll notice on the audio track that it’s a bluesy feel on offer. If you’re wondering how that can be classed as country, check out Vince Gill’s High Lonesome Sound album and some of Clint Black’s material. Anyway, as I played rhythm guitar behind piano, I felt comfortable adding a few jazzy chord fragments, although I would normally recommend keeping things relatively simple. However, if it works don’t worry about whether it is or isn’t country, or is or isn’t jazz and so on. The blues shuffle is such a simple form that it might come as a surprise to find that notating this kind of feel can be awkward. The issue is whether to write in 4/4 and accommodate the triplet feel by way of a global marking. For example: each pair of quavers needing to sound like the first and last parts of a group of three (quavers) – a triplet (eight note). Choosing that option is generally the preferred approach for both writer and reader. But, for this example, I felt obliged to choose 12/8, which is the most naturally accommodating time signature for a shuffle. My reason for doing so here is to better express the time values; the duration of notes should sometimes allow for some breathing space. Another tricky situation is how to notate trills that are pushed (tying across the main beat in this case). Well, for illustrative purposes I tried one way in bar 1 and, for a similar lick, a different method in bar 7. Bar 1 begins with a blues staple whereby a single bass note is fingered, followed by a double-stop -effectively a fragment of the IV chord – plus a minor 3rd-major 3rd trill (Bb-B notes in G7). By the way, the percussive muted clicks at the end of the bar are not unduly messy sounding and are a result of simply keeping time. In bar 2, and in general throughout this piece, I demonstrate how using a chord fragment, leaving out a low bass note, can often help clean up a mix. Always pay attention to what the bass guitar is doing and notice how occasionally jumping in early with the next chord (G, in this case) adds excitement. I approached the IV chord in bar 5 chromatically from above using Db9, with a brief hammer-on to the 13th upper extension. Incidentally, that note (Bb) is, interestingly, equivalent to G’s #9 or b3rd, so it acts as a common tone – a kind of glue. Such knowledge helps you negotiate chord changes with confidence. Bar 5’s C9 chord was quickly raked across using a plectrum while the next sound was created using hybrid picking. Although I might strum using a pick for certain blues tunes while I also enjoy fingerpicking others, here I just did what came naturally. Going into bar 7 I felt inclined to play the bass note of the chord ahead of the remaining harmony (chord block). Again, it just felt right and isn’t necessarily a rule. Bar 8’s E7 chord was an opportunity to add some colour. My self-penned chord chart showed E7#9 – the “Hendrix” chord – which I could have reduced to a simple E7 but I went the other way instead, with my little finger fretting a note that I knew would work: C, the b13th of E alias B#, the augmented 5th. Knowledge of chord extension, alteration and substitution can work wonders where appropriate. Heading into bar 10 is a case of falling back on experience – I can’t honestly say that I thought of any point of theory or anything; they’re just chord fragments that I’ve used in the past and I’m confident about using again. I can see that I relied on my knowledge of chord synonyms to interpret a C major triad as being part of a D11 chord. For the penultimate chord, I happened to throw in an Ab13#ll, which I learned years ago while transcribing some Robben Ford stuff. 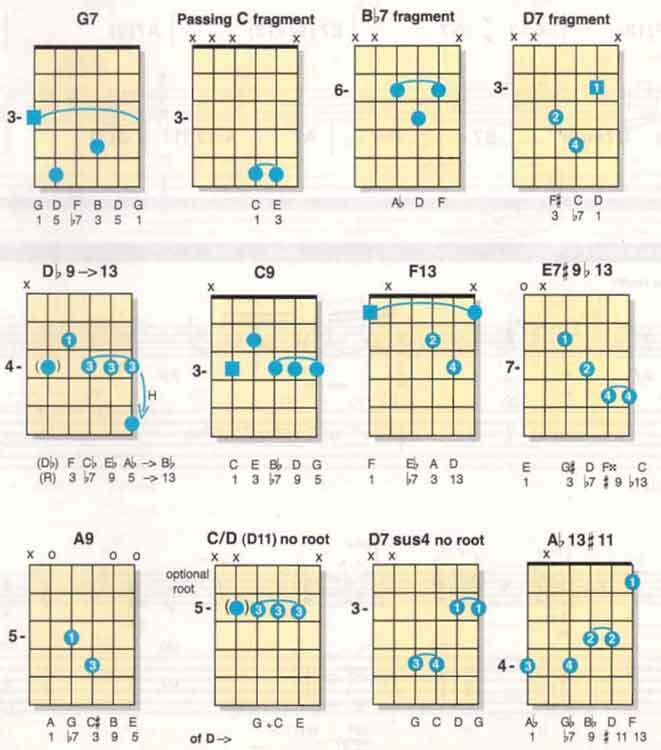 I knew that F would fit in with the following G7 chord, which was just a step away. Anyway, the chart said Ab7 but I substituted that finger-stretcher just described. When you substitute you keep a few original ingredients. If, on the other hand, you keep no common tones, producing a totally new chord, it’s more radical and bound to sound (overly) jazzy. Be careful with your choice of notes.